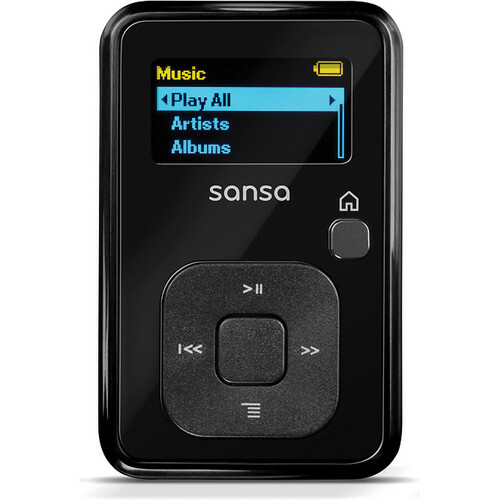 The Sandisk Sansa Clip+ MP3 Player (2GB, Sleek Black) is a pint-sized powerhouse of audio wonderment. This compact, go anywhere MP3 player attaches to your clothing or bag with the namesake clip, leaving your hands and pockets free to handle other tasks. The 2GB Clip+ can hold up to 500 songs in the MP3 format and up to 1,000 songs in the WMA format. In addition to these popular music files, the player will also support secure WMA, Audible, Ogg Vorbis, and FLAC, along with audio books and podcasts. No matter what format you choose you can see all your song info, playlists, and more on the bright 1 inch landscape style OLED screen. And should you find yourself needing more memory the Clip+ has a micro SD/SDHC expansion memory slot. Aside from housing your personal music library the Clip+ does double duty as a digital FM radio. The FM tuner features 40 presets for all your favorite stations. There's also a built-in microphone for recording notes to self, or any other sounds that catch your attention. In addition to these great functions, the Clip+ also boasts 15 hours of continuous playback. When it's time to charge the battery, simply connect the player to your computer using the included USB cable. Box Dimensions (LxWxH) 5.9 x 5.0 x 1.3"
2GB Sansa Clip+ MP3 Player (Sleek Black) is rated 4.5 out of 5 by 64. Rated 5 out of 5 by Anonymous from Bang for the buck I use this product mainly at the gym but also for mass transit. It more than meets my needs. I have a standard workout playlist that is only about 100 songs and the rest I rotate. Thus, I'm not a carry-my-entire-library-around-with-me sort of person, though using an SD card, one could probably do just that. Pros: Cheap, small, handy clip on design (SO much better than arms bands imho for the gym), simple and no non-sense design operation and interface, fine battery life Cons: small (only for the disorganized who have occasional panic attacks when it does not immediately appear in my hand as I search through my gym bag). Rated 4 out of 5 by Anonymous from I have bought this great MP3 twice! I use this while I travel. It's light, intuitively designed and expandable!!! I like that I can expand the memory. I bought the small 2GB version and then just loaded it with a 8 gig micro SD. When my first clip was stolen, I did the research and then bought this again. My only complaint is that I can't synch it with my iTunes. I can move music from my iTunes to the Clip with no problem... Overall, I am very happy with the unit. Oh, I also love to record my voice notes with this player too. Embarrassingly, I keep recommending this MP3 player to my traveling friends. Rated 4 out of 5 by barrybe from Great lightweight mp3 Love the sound quality of this mp3... quite remarkable. The navigation through the menus is adequate and largely intuitive. On a slightly negative side, when I received the unit the LED menu instructions were in some language... definitely not english. After some trail and error choices I was able to find the language option (in some foreign language) and able to switch the unit to english. Also I would rather that the UBS plug in be part of the actual unit and not an additional small cord which since it is separate always presents the possibility of losing. In spite of these two negative comments I am very happy with the performance of the unit and may even purchase another one for a friend. Rated 4 out of 5 by Equafinality from Little mp3 packs a big punch! This is a criminally underrated mp3 player. Why? First you can throw in a big SD card & make it hold much more than the 2GB it comes with. (Currently mine has a 32gb). Second the sound quality is excellent. Really top notch. Third since it's so small, it's great for exercise. It just clips onto anything & it's easy to swing songs or raise/lower the volume. It weights practically nothing. Fourth, the battery life seems to go on forever. I charge it every now & then. Finally, if you're tech savvy, throw rockbox on it. It's an alternative OS that really makes it shine. Too many bells & whistles to count. Rated 5 out of 5 by Anonymous from It's perfect !! Was looking for an MP3 player to use while walking and running. This thing is perfect. It's comically small but yet it's easy to see and use. It sounds great and the battery life is great. I love the drag and drop software. So much easier than having to synch stuff. Don't get hung up that it is only 2 gigs. Right now I have over 800 songs in it. That is plenty for music unless you are going to be a DJ. Combined with the fact that it cost less than $40 it is a complete no brainer !!! Rated 5 out of 5 by lecture listener from great product I use this for listening to audiobooks.I love that it is extremely easy to fastforward and rewind,especially since it speeds up the process if you keep pressing.Ialso enjoy that it keeps my place if I switch to another book or song.Plus,you can't beat the convenient size with the clip.I would reccomend this to anyone. Rated 5 out of 5 by didi from just what you're looking for I bought this product as a gift on the recommendation of my brother, who owns one and loves it. There are several elements of the 2GB MP3 player that make me believe that someone at Sansa is using their head: 1) Addable (is that a word?) memory. What could be better than the option of popping in additional memory if you find you need it instead of shelling out extra moo-la at the outset? 2) Size and weight. It's so small and light you barely know it's there. Just don't forget it in your jeans pocket and then do laundry. 3) Battery life. Not quite as amazing as apple, but pretty darn good. 4) Voice recorder. Why not? maybe you'll be the next winner on American Idol. 5)Price. It doens't break the bank. The only down side so far has been the packaging. Get out your saws-all. Rated 4 out of 5 by mrsammy7 from Small but Powerful Limitations because of it's overall size, but once music is added it's easy to use. Quality is good. We would buy the 4gb model next time to allow more space for downloading.